PHIL's patent pending Body Lifting System is unique to PHIL HiVol® bodies and is also available as a retrofit conversion for most makes and models of off-highway truck bodies for rigid frame off-highway trucks. The design utilizes four free-floating "lifting bells" keyed into the floor structure. 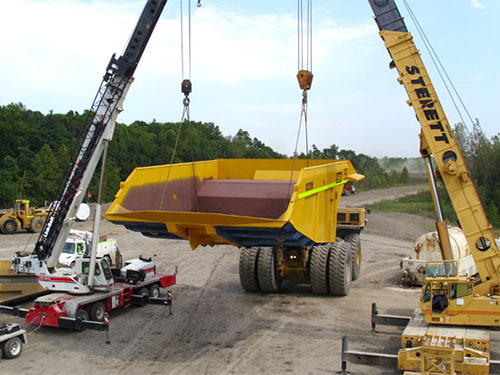 When the mine site is ready to remove or install a truck body, small lifting ring covers are removed from the floor, the lifting bells are raised through the holes from underneath and then conveniently and safely attached to the rigging from inside of the truck body. Zero "pull in" on the body sides. Holes do not fatigue over time similar to lifting eyes on body sides. Engineered with a multiple-capacity safety rating and certified by a reputable third party. Safe alternative to traditional method. Easier and safer to rig for personnel. Provides a secure tie-off point when transporting truck bodies outside of the mine site enivronment.